Cocoa Beach is awesome! Before our cruise from Port Canaveral we took a timeshare tour of the Ron Jon Cape Caribe Resort and saved money on hotel stay at the Country Inn and Suites in Cape Canaveral. The hotel is the closest hotel to Orlando and Port Canaveral. $49 per night is what we paid! We took a tour of the Ron Jon Resort and stayed at the Country Inn and Suites. The tour was nice and we only paid $49 per night which included free parking and shuttle service. We found the package at http://www.cocoabeach4less.com. 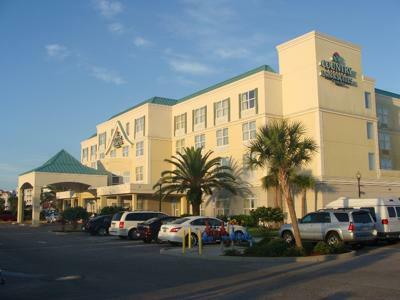 We also stayed at the Country Inn and Suites in Cape Canaveral, FL in early May, 2010 before a cruise, but did not take advantage of a Timeshare promotion discount. We paid the "Park and Cruise Special" price of $97, which wasn't too bad considering price of parking car for several days otherwise. Room was spacious and clean. We would go there again.